This example uses the REGEX_REPLACE function to transform a string in Amazon Kinesis Data Analytics. REGEX_REPLACE replaces a substring with an alternative substring. For more information, see REGEX_REPLACE in the Amazon Kinesis Data Analytics SQL Reference. You then create an Amazon Kinesis data analytics application on the console, with the Kinesis data stream as the streaming source. 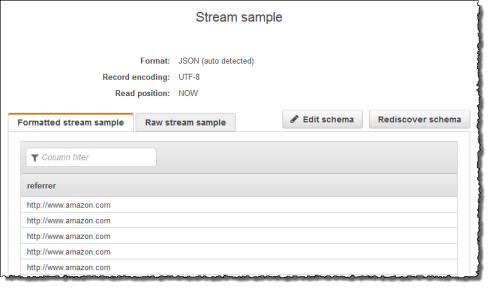 The discovery process reads sample records on the streaming source and infers an in-application schema with one column (REFERRER) as shown. Choose Discover schema. Wait for the console to show the inferred schema and samples records used to infer the schema for the in-application stream created. The inferred schema has only one column.